Forensic meteorology is the science of using historic weather records, atmospheric data, eyewitness accounts, and reenactment simulations to determine the weather conditions at a specific time and location. A forensic meteorologists's analysis might be to corroborate or invalidate an alibi, provide context for an accident, or even to determine if the conditions could have been reasonably anticipated or were a freak chance event. It's very BBC Sherlock to contemplate using the weather to solve crimes. In the opening case of the first episode, Sherlock pairs observations of asymmetrical mud splatter and a lack of umbrella with local weather reports to deduce a victim's probable activities before the murder. While real-life forensic meteorology lacks the thrilling pacing and distinctive visual style of Sherlock, it is a real field of science used for everything from murder trials to insurance claims. Forensic meteorology has been used in all sorts of circumstances. While writing for Physics Today, Elizabeth Austin and Peter Hildebrand tracked down a slew of court cases where a meteorologist was employed as an expert witness, including: murders, suicides, bombings, vehicle accidents, traffic accidents, skiing accidents, bad aircraft landings, kitesurfing accidents, agricultural disputes, property insurance disputes, building collapses, people slipping and falling, fires, and as a defence for stealing, looting, or trespassing. The range of weather involved in this cases can be equally as diverse — rain, snow, ice, tornadoes, hurricanes, air pollution, drought, floods, microbursts and epic storms can all lead to situations where a meteorologist takes the stand to carefully explain what the weather conditions were and how it impacted the environment. One of the first instances of involving weather in the process of law was in the late 1800s, after a minister organized a community prayer for rain during a severe drought. Within the hour, a storm rolled in, dumping just under 2 inches of rain, washing out a bridge, and burning down a barn with a lightning strike. The barn's owner had been the only objector to the prayer, having declared that humans had no place to meddle in the affairs of nature. Seeing the loss of his barn as vindication for his belief, he sued the minister to replace his barn. The minister fought back, his counsel arguing that while they'd asked for rain, the lightning was a "a gratuitous gift of God." The court agreed, dismissing the claim. The relative frequency of particular weather events is a common theme in civil cases. Did a city adequately anticipate normal severe rainfall when designing their sewer system and were overwhelmed by an unpredictable freak event, or did they underestimate the predictable pattern of storms and fail to build an adequate system? When a roof collapses under the weight of piled snow, was it a failure of engineering to build for the expected environment, or was the roof adequate and the snowfall far above any reasonable expectation? A forensic meteorologist's analysis of the relative rarity of specific high-impact events can be pivotal testimony in determining fault during the subsequent insurance and building disputes. Not every expert's testimony influences the case's outcome. A driver was hit by a piece of falling ice while crossing a bridge, with the fragment breaking his windshield and hitting him in the eye. He claimed the ice was part of an icicle breaking free of the bridge, while the local transportation authority claimed the ice must have been flung off a passing truck. The forensic meteorologist testified that ice from a truck while be opaque, while an icicle growing on the bridge would be clear. An eyewitness said the ice was clear, leading the meteorologist to support the driver's accusation. Despite this, the jury found in favour of the bridge, concluding that a truck was responsible for flinging ice. The first requirement is that a meteorologist is actually a meteorologist. While technically this is an unlicensed profession so anyone can work as a meteorologist, most who get called to the stand have voluntarily submitted to certification from their professional organization. From there, the rule requires that meteorology is relevant to the case, that the analysis is based on reality, that their analysis uses logical processes, and that the expert is sufficiently objective to let their analysis determine their conclusions irrelevant of the human context. That last bit can be difficult: a forensic meteorologist's interpretations and professional opinions must be guided by facts, not by their personal opinions or sympathies. A perfect example of this is an ongoing legal dispute stemming from a mess of a storm in 2011. On April 27th, cold, dry air coming south from Canada smashed into warm, moist air surging north from the Gulf of Mexico. 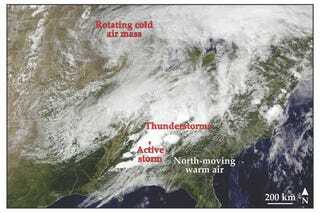 A jet stream flowing north-east made the whole situation worse, swirling colliding air masses into into supercells. The first wave hit in the morning, thunderstorms and tornadoes crossing the southeastern United States; the second wave hit hours later. Seven states were impacted, with Alabama baring the brunt of the damage. After the storms died off, the insurance companies and property owners were left trying to determine which damage was caused by the straight-on winds of thunderstorms, and which was caused by the rotating winds of a tornado. Over three years later, it's still To Be Determined, with forensic meteorologists using digital weather radar, surface weather observations, and reports to determine the timing, extent, duration, and strength of events, and, from that, the nature of the damaging winds. As insurance policies can easily cover one type of damage but not the other, the outcome of the meteorologists' analysis will have a massive economic impact on the storms' survivors. For their sake, I dearly hope the meteorologists involved in these cases have no idea which insurance policies cover what damage for which homeowners, leaving them free to do their jobs without feeling guilty over the consequences. In one of the more intimately bloody cases of weather in the law, an accused murderer claimed he sustained a scratch on his hand while snowboarding with his son and not during the attack. The forensic meteorologist on the case testified that it was raining at the time of the alleged snowboarding. Not only would that be a memorable detail neglected by the suspect, the rain should have melted the meagre snowpack, leaving the slopes impossibly bare for snowboarding. This testimony was enough to discredit the suspect's claim, a small piece of evidence adding to the collected whole that eventually saw the murder convicted. In a different murder trial, a husband was accused of murdering his wife. He claimed an intruder did it. The forensic meteorologists were able to determine that the neighbourhood, particularly the grass around the house, would have been soaked with dew at the time of the murder. Any intruder would have left soggy footprints, something clearly lacking at the crime scene. This was enough to once again disprove the proposed intruder, helping narrow down theoretical suspects in the murder. The examples keep on coming. Every major natural catastrophe will bring out forensic meteorologists to determine what exactly happened. Inclement weather will elicit attempts to blame any accidents on the weather, leading meteorologists to decide where weather fits along with human judgement, company policies, and equipment limitations. As we expect to keep getting more intense and more frequent extreme weather events as climate changes, forensic meteorology is just going to keep getting more important in sorting out what happened and how predictable it was. While for now it's a somewhat obscure, forensic meteorology is slowly gaining credibility as yet another way of bringing science and fact-based testimony into the courtroom. Even better, the amount of data available to pull into these cases is extensive, with detailed radar archives, rainfall gauges, volunteer observer reports, wind maps, and more to help meteorologists with their analysis. But the real question is: how will forensic meteorology be glamorized when it makes its inevitable break into the television with its own crime-solving hero?